Q: What is the deadly secret of Monkey Island? 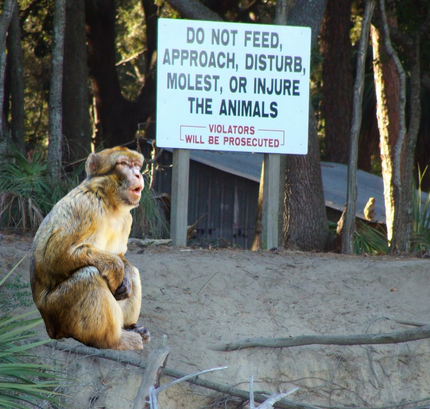 Just off the coast of South Carolina, Morgan Island (nicknamed "Monkey Island") is an island inhabited by more than 4000 rhesus monkeys. The monkeys were originally housed in a lab in Puerto Rico where they were tested on in attempts to create a polio vaccine. During this process, they got infected with herpes B, a strain of herpes lethal to humans. After some started to escape the lab and infect the local people, in 1979 all 1400 of them were shipped to Morgan Island to isolate, contain and study them. Since then, the monkeys have continued to be used as test subjects for other experiments, including research into child diseases, AIDS and, after 9/11, bioterrorism. So while they were originally infected with herpes, goodness knows what else they're carrying now! With the exception of the occasional research scientist, no humans are allowed on the island - although local tourist companies do run boat trips to the island so people can view the monkeys from a safe distance offshore. Only one monkey is known to have successfully escaped the island - in 2005, when a 10-year-old male was found in a tree seven miles away from the island. No one knows how he made it to shore, since the monkeys can't swim very well. "Monkey Island is neither an island, nor does it contain monkeys. If you first drive through Disney -- 25 miles (40 km) southwest via State Highway 85 -- and tell the kids you're going to Disney and Monkey Island without further explanation, you can easily make this one of the most disappointing road trips of their lives." According to the American CDC, a quarantine is when a healthy person is kept separate from others, to see if they develop a disease to which they may have recently been exposed. If a person/animal is already infected, then separating them from others is known as isolation. The word comes from an Italian variant (seventeenth-century Venetian) of 'quaranta giorni', meaning forty days, the period that all ships were required to be isolated before passengers and crew could go ashore during the Black Death plague epidemic. An uninhabited island off the coast of Scotland was quarantined for 48 years after the British government used it to test anthrax bombs during the Second World War. In 1942, eighty sheep were transported to Gruinard Island (pronounced "grin-yard") and then subjected to detonations of bombs filled with anthrax spores. All of the sheep became infected and died within a few days. Footage of the tests was released in the 1990s, and is now visible on Youtube. Eventually in 1990, after further decontamination efforts involving 280 tons of formaldehyde, the island was officially declared anthrax-free, and reopened to the public. Where would you find the most viruses and diseases in an airport?